Objectives: Understand the main features of a prayer hall (Musallā) and understand its uses. So that they do not distract each other. 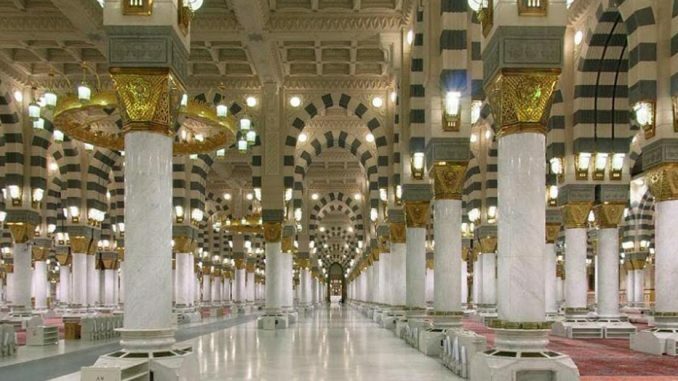 This is the Prophet’s Mosque in Madinah. It needed to be immense to cater for hundreds of thousands of worshippers daily. Women (and men) are required to maintain strict segregation and code of dress in the Mosque. Everything in the prayer hall is designed to create the right atmosphere for prayer – free from worldly distractions. It is important that the Muslims treat the mosque with respect and keep it clean and free from foul odors. A Muslim is not allowed to attend the Mosque after eating raw garlic and onion due to the odor harming the Angels and other worshippers – likewise applies to other foul odors. Most mosques have a shoe-stand at the entrance to the Mosque so as to keep the prayer hall dirt-free. Of course a Muslim is allowed to pray in their shoes – in fact it is Sunnah to do so, just as it is also a Sunnah to not pray in them as well (so both should be practiced) – but to maintain the cleanliness of the prayer hall, most mosques prohibit the wearing of shoes – however removing the shoes is not a shari’ah requirement. The shoe racks have to be carefully organized because thousands of people could be trying to find their shoes after the prayer! Qiblah and Mihrāb: The direction of prayer in any mosque is towards Makkah. Many mosques show this direction by use of a Mihraab, which is a niche or an alcove at the front of the mosque where the imām stands. This mihrāb actually was not used by the Prophet (ﷺ) or the Rightly Guided Caliphs, so it is better avoided according to most Salafi scholars. Makkah is south-east from the UK so this is the Qiblah (or direction of prayer) for Muslims living there. When Muslims focus on one single direction in prayer, they are reminded that their lives should focus on the worship of only one God. They also feel that they are a part of large worldwide community that has been facing this direction in prayer for over 1,400 years – and even before that according to the Quranic scholars. The Mihrāb is sometimes highly decorated but it may also be simple so as not to distract the worshippers (and that is better). The imam stands in the mihrāb to lead the prayer, but that too should be avoided since there is no textual evidence for the practice and it often screens the view of the worshippers who are expected to follow his actions. So it is best avoided to build a mihrāb in a mosque due to the absence of evidence proving its allowance. Mimbar (Pulpit): When the imām delivers his sermon (khutbah), he stands on a mimbar which is built or placed at the front of the prayer hall. It consists of three steps. It should be simple, but some mosques make it an ornate decorative feature, with is also not correct according to many scholars. Its purpose is simply to allow the congregation to see and hear the preacher (the khateeb). 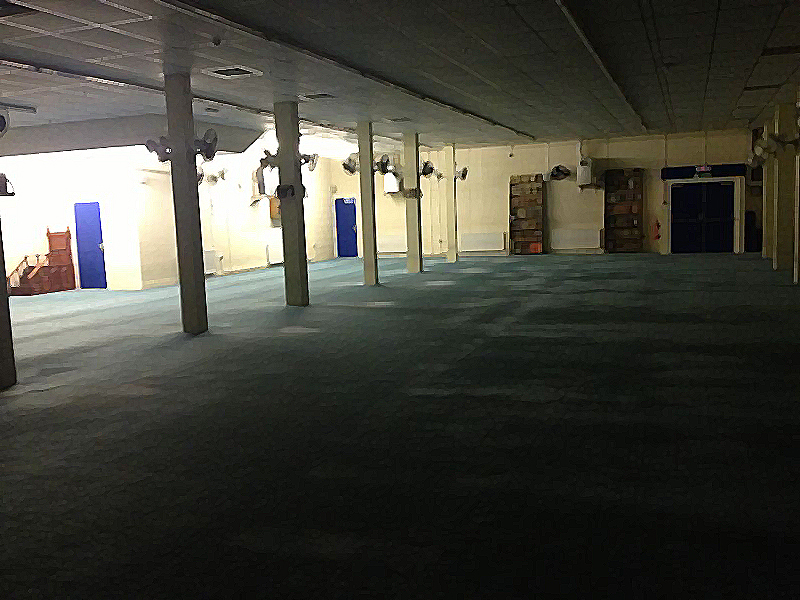 This is the Salafi Mosque in Birmingham, UK. Prayer Hall (Musallā): The prayer hall, like the rest of the Mosque building, must have no pictures or statues in it. That is because image-making of humans and animals (showing their faces) was forbidden by the Prophet Muhammad (ﷺ). Pictures and overly decorative features in a Mosque distract people from worship. Furthermore, images of the Prophet or any other Prophet (or Companion) is strictly forbidden. Muslims strongly believe that Allāh cannot be represented by images and drawings because He is the Unique, free from all likeness to the Creation. Muslims totally reject the worship of images and statues and pictures because only Allāh should be worshipped and He cannot be represented by images. Many mosques instead, decorate the walls and the dome with verses from the Qur’aan or the Shahaadah. However, even this was not the practice of the Prophet nor the Rightly Guided Caliphs. A Mosque should be clean, comfortable, serene and welcoming. It should have shelves for the Qur’an so people can read and memorise. It should also have authentic religious books and tafseer books (Qur’anic commentary) because the Mosque is place of study and contemplation too. The floor and carpet: The prayer carpet may have a simple pattern that marks out the space for each person to pray. It is laid down so that the worshippers are facing Makkah in rows. The stand feet to feet and shoulder to shoulder, leaving no gaps for Shaitān to enter between them. Upon one wall of the hall there is often a clock display or a timetable showing the times of the five daily prayers and the Friday Jumu’ah prayer.